YJ LINK has developed MICOM(Embedded System) based on microcontroller and applied it to PCB handling equipment, and YJ’s facilities equipped with MICOM can build Smart SMT Line as Smart Conveyor System. This is a solution that enables an enterprise-wide integrated management and automated production line. The YJ equipment constituting the smart SMT line is connected to the line control PC(A separate computer for central control of the YJ facilities) through LAN communication. 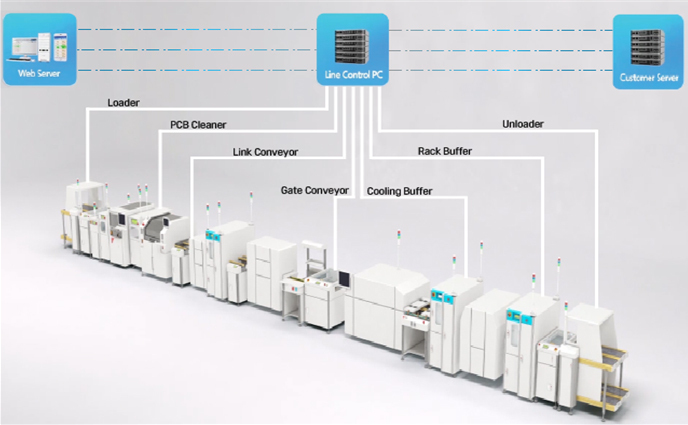 The customer transfers the PCB information to each YJ facility through the line control PC, so that the operator can change the width easily. In addition, it is attracting attention as a next-generation SMT solution that improves the productivity and competitiveness of customers by enabling real-time monitoring of facility status. *Laser markers communicate separately through client’s server. When applying the data of the production model, each transport device of YJ carries out automatic width control. *Web server only provides monitoring function. If the maintenance period is set to a certain cycle for each equipment, an alarm will ring. - The Customer SERVER reads the result value of each transport device of YJ’s stored in Line Control PC. - The machine must be equipped with an electronic speed control controller in advance. - It is possible to produce more than two kinds of model by auto width adjustment by scanning those models. - It is necessary to mount the scanning conveyor at the location where you want to trace the models. The more the number of scanning conveyors, the more accurate the position tracking is possible. - Simultaneous production of multiple products due to production line branching in multiple lines. 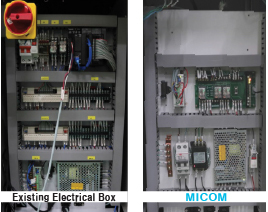 The core technology of MICOM developed on the basis of micro controller is meaningful to provide system environment for SMT line integrated control management and automation of production equipment. It can control motors, digital signals, and is equipped with a GUI for facility interface, which makes it possible to control the equipment operation more efficiently than PLC, a conventional control system. It expands the product range starting from basic type control module, extended type, and advanced type and enable integrated control solution construction. 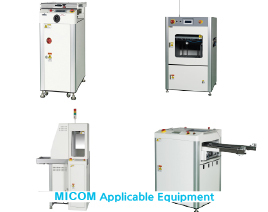 MICOM makes it possible to process the necessary data for functions such as smart lines. It also has unlimited data processing capabillities. Unlike the conventional monochrome PLC screen, new LCD touch screen can display various menu configurations.